When I was a youngster living in Sydney’s west, it wasn’t the culinary melting pot that it is now. On my last visit home, the main drag of Merrylands’ restaurant count included Vietnamese, Turkish, Lebanese, Chinese, Thai and a couple of others. Nearby Parramatta is even more diverse. But in the 1980s in Parramatta, there was a restaurant called inexplicably Pinkys (the only name more inexplicable was the Foo Doo Chinese up on Sherwood Road, but that’s another story). And at Pinkys, the only thing on the menu was fondue and lots of it. Melted cheese in all its glory. I never actually went to Pinkys and it is long closed and replaced by an excellent Malaysian restaurant, but my interest in fondue remained. It’s part of a Swiss Gastronomic Festival running this week at the hotel’s signature restaurant, The Grill. The festival includes a buffet of Swiss salads (which to my excitement, seem to include a lot of meat), main courses (think veal, noodles and oodles of cream) and of course, fondue and raclette. 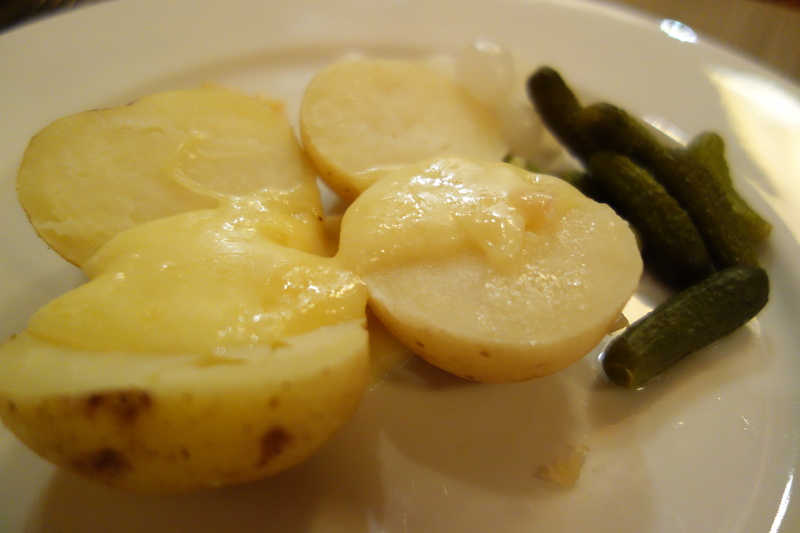 We started with the raclette, served traditionally on boiled potatoes with sides of cornichons and pickled onions. 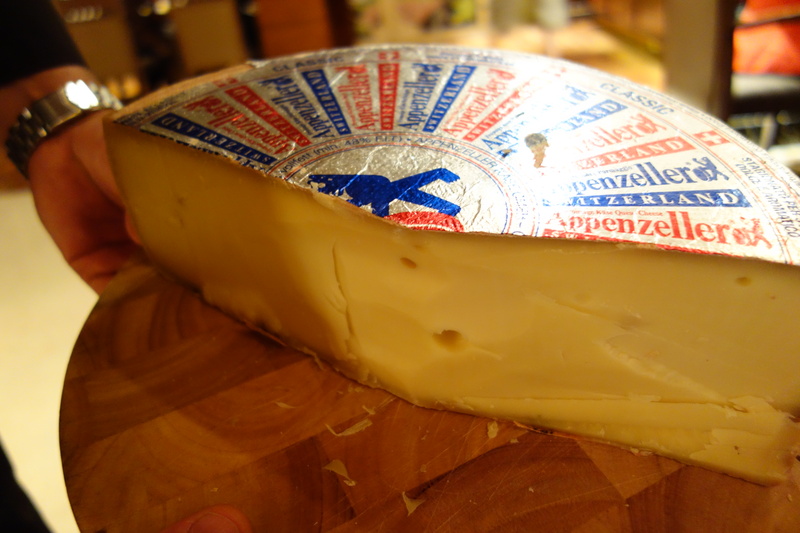 Raclette is a semi-firm, cow’s milk cheese – most commonly used for melting. 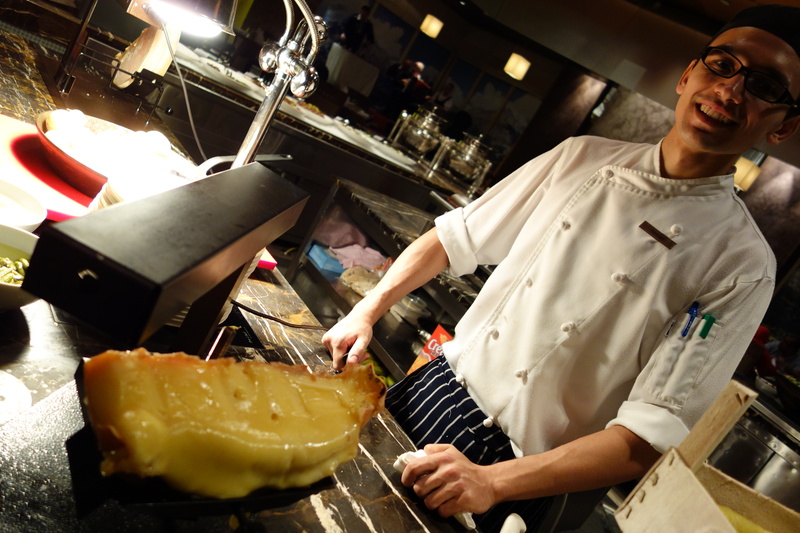 The Raclette cheese round is heated, either in front of a fire or by a special machine, then scraped onto diners’ plates; the term raclette derives from the French word racler, meaning “to scrape,” a reference to the fact that the melted cheese must be scraped from the unmelted part of the cheese onto the plate. Cheese, potatoes…what is not to like? 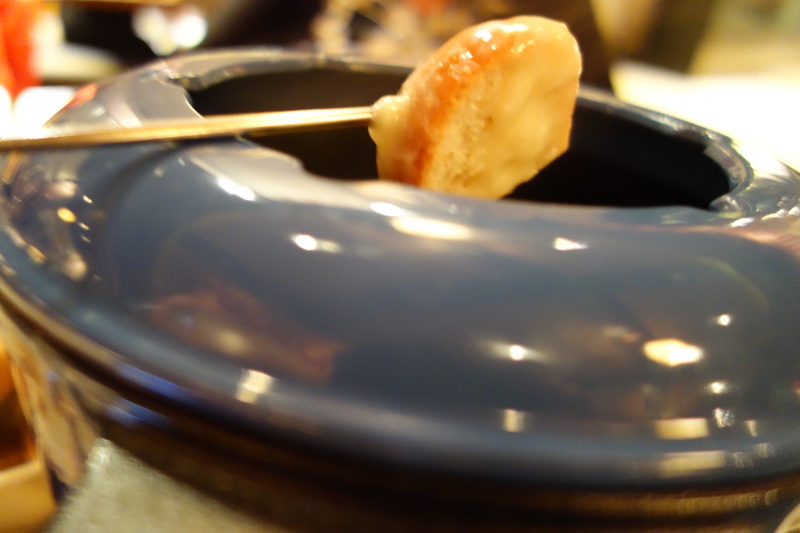 The raclette cheese itself was just the right consistency and the potatoes a great blank canvas. Raclette dining is supposed to be relaxed and casual and believe me, after a couple of plates of this and a couple of wines, I certainly was. Raclette is usually served with warm drinks or wine as Swiss tradition cautions that other drinks – water for example – will cause the cheese to harden in the stomach, leading to indigestion. Ahem. Then, it was fondue time. Rich with white wine, this fondue was also made with the traditional Gruyere, Emmenthal and also Appenzeller. 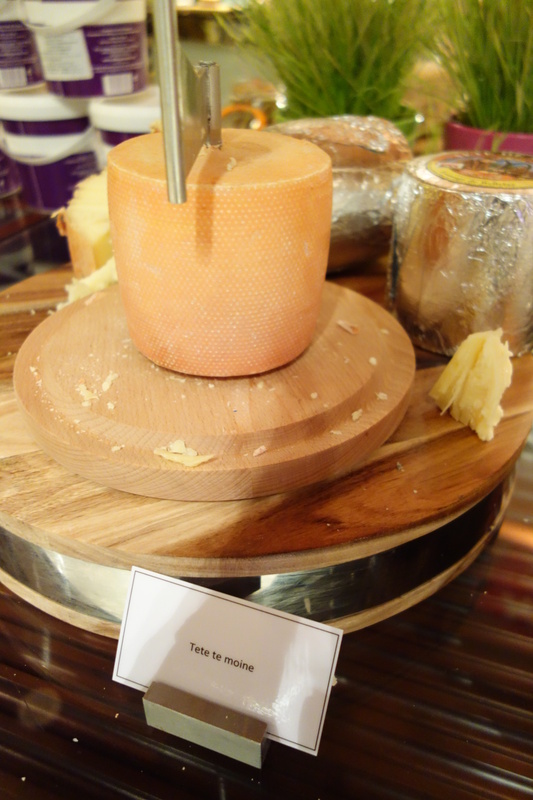 Meanwhile, the offering at the Grand Hyatt Doha included an impressive array of cheeses (and A Swiss band…I wasn’t drink enough to yodel) which I plan to work my way through later this week. This includes the Tete De Moine, alarmingly translated as “Monk’s Head” – a Swiss cheese from Bern that must be carefully scraped with a knife to develop its’ flavors. I tried raclette cold once! Had no idea. Was very unimpressed. Then a friend brought a raclettte machine to dinner once. Oh. My. God. That was quite the awakening. Couldn’t do it every night though, my arteries would harden very fast. Wait? COLD? Yikes. It was so rich…but yes, addictive! I love both raclette and fondues. Unfortunately about to leave on holiday so won’t get to the Hyatt to sample, but you make it sound oh, so good! If you’re ever in Zurich… we went to a fabulous place last summer for both!